After my trip to the Jewish Museum, I walked through Central Park, past the Metropolitan Museum of art (which I had not yet visited and was still disillusioned by), and continued down the Museum Mile. I stopped for lunch at a small deli on Park Avenue, then traveled down to the Museum of Modern Art. 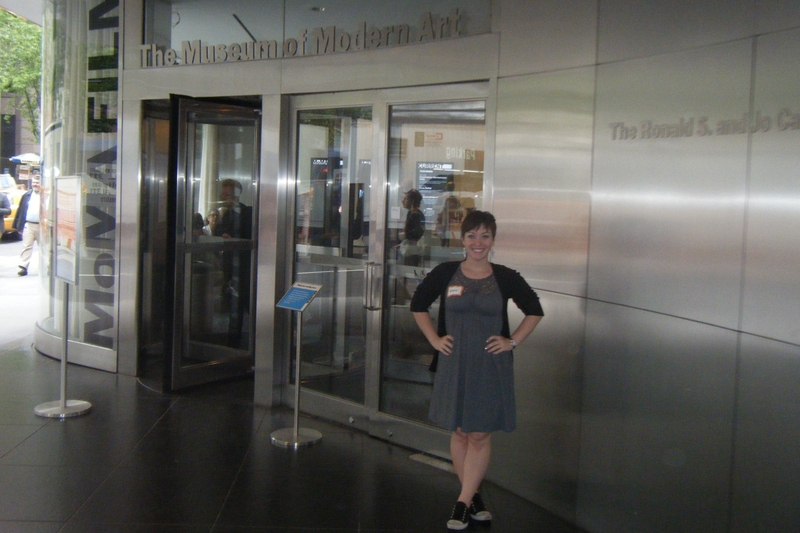 I found out about the MOMA Accessibility programs through the Museum Access Consortium of New York, and the staff was gracious enough to respond to my emails and invite me to observe one of their accessible programs. I want to share some of my experiences with this program, and some of the comments that attendees made while on the tour. As stated above, the program I attended was created for adults with dementia. The group I was with was made up mostly of elderly people with some younger caretakers and family members. As we went through the galleries, our guide Paula stopped at 4 important pieces throughout the hour to ask questions and get feedback from participants. We looked at Starry Night by Vincent Van Gogh, Mademoiselles d’Avignon by Pablo Picasso, Bicycle Wheel by Marcel Duchamp, and Christina’s World by Andrew Wyeth. As a side note, I am not an artist nor an art historian. My own views of these pieces are irrelevant, but I will say that I really enjoyed the honesty of some of the participants when describing these works of modern art. 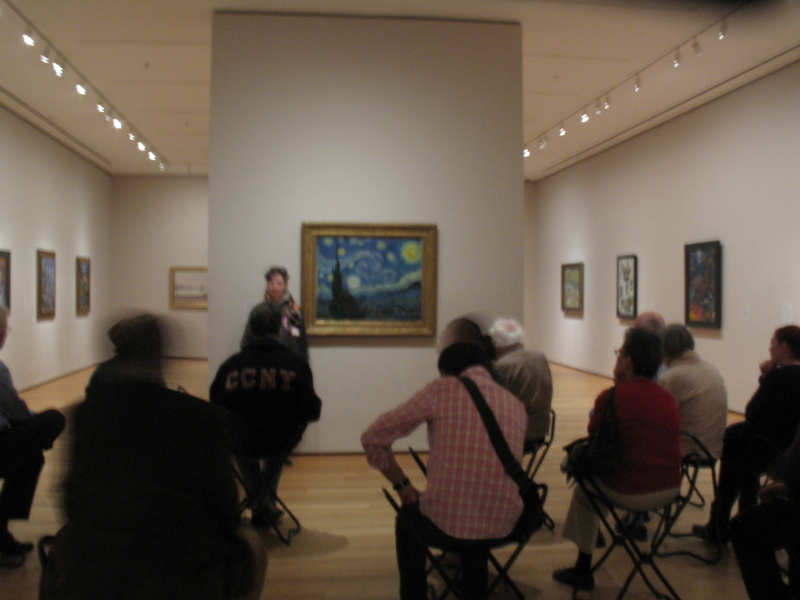 The first piece we visited was Van Gogh’s Starry Night. As another side note, the museum was closed for this program, and being in a small group, I was able to get up close and personal with this piece – it was amazing. The guide asked such questions as, “what are we looking at? What are your observations?”. Participants had insightful answers such as, “it looks like lights when you take your glasses off” and that looking at this painting made an individual feel that there was, “nothing little about twinkle twinkle little star.” Others thought that the village seemed to be overwhelmed by the sky, the artist used, “blobs of paint”, and that the painting conveyed the feeling of a cold night by using cool colors. The guide also asked, “What feelings would you say describe the work?” Answers included: overwhelming, peaceful but the sky is exciting. 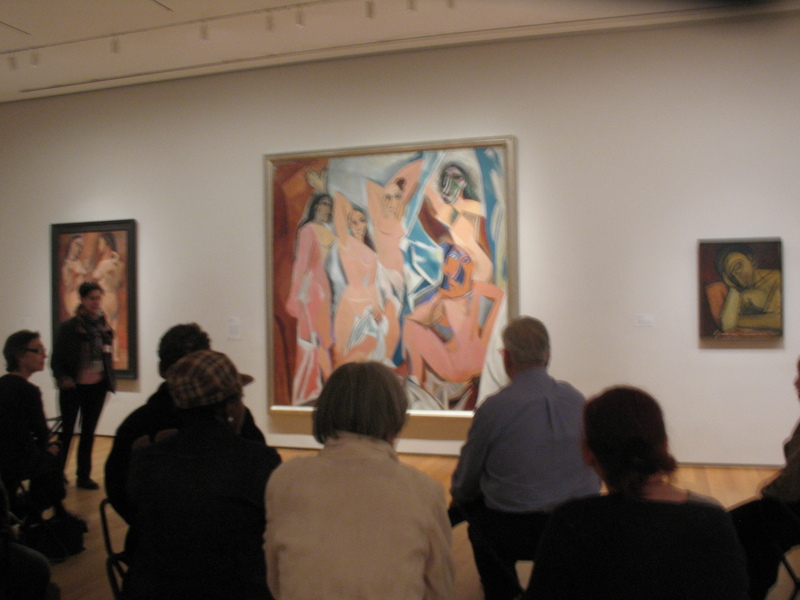 Next we ventured into another room to view Mademoiselles de Avignon by Picasso from 1907. 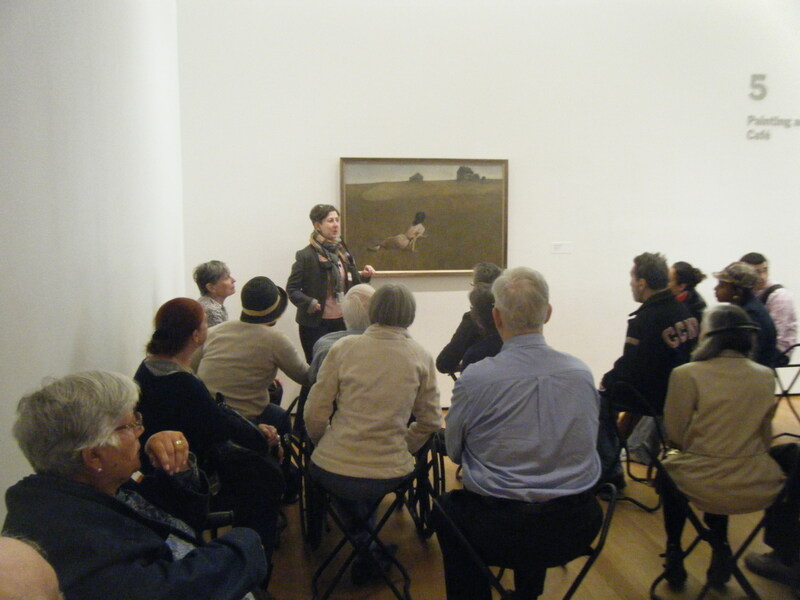 Participants were invited to study the piece and make observations and comments. Most agreed that the painting showed lots of women, but that they aren’t real women. The general shape, eyes, and bodies are strange. They aren’t soft bodies but instead are hard and square, and the eyes are crooked. When the guide asked, “where are they?” answers included: Hell, a scary place, and a studio with drapes. People described this painting as: an image of despair, being of women, but the 2 women on the right side are not human, staring at us, there is no life, nightmarish, aggressive, painted by a man but women are masculine. A particularly insightful participant pointed out that perhaps the women are hiding their identity behind a public masks, and the African style masks are one step further to hiding their true selves. The intriguing sculpture Bicycle Wheel by Marcel Duchamp was the next piece the group visited. The comments on this piece were some of my favorite. Participants said that this piece presented both a challenge and a possibility. This was countered by another person who claimed the piece was simply absurd – there are no possibilities here! Someone else asked the question, “What makes this art? Because it is in a museum?” This led to the every-important discussion of what art is, and how something can “become” art. The point was made that if this piece were in your basement it would be seen as trash, or as something in need of repair. Another person said that this sculpture was “not enough to be art in a museum.” The guide asked what it needed to become worthy of being in an art museum. The honest answer was, “It just doesn’t turn me on.” It was then discussed that this was intended by the artist to be art , and that anything can be art, but that doesn’t mean you’ll like it. 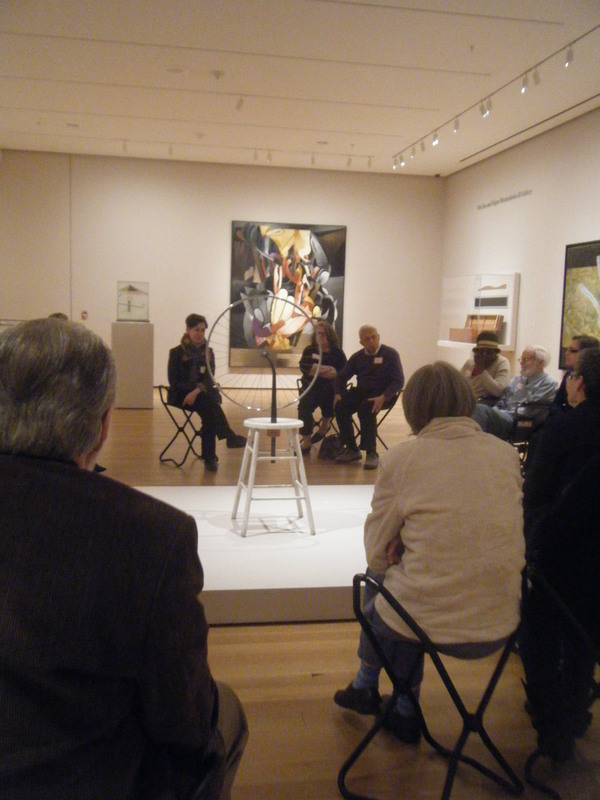 Another participant said that the piece represents art on a pedestal by putting a bicycle wheel on a stool. One man, who said he was a painter, said he feels that his art, and any art really, isn’t art unless someone looks at it and reacts to it. The last piece we visited was Andrew Wyeth’s painting Christina’s World from 1948. One person said that the landscape looks like western Kansas where she grew up. The group agreed that the subject seem to be seeking something; the house is her goal. She is an attractive woman, graceful, but it seems that something is wrong with her. She is desperate, disabled, yearning to walk, has no muscle tone and chafed elbows, and she resides in a bleak and barren landscape. The painting is spare and realistic, while the colors reflect a grim mood. Others pointed out that while she is struggling, her pink dress is not desolate. She has a hard life, but she is pushing and determined. Throughout the session, the gallery guide would often repeat questions, comments, and answers more loudly so everyone could hear them. She was also very patient with the audience and made sure that everyone was comfortable and understood what was going on. The program was very enjoyable, and the participants seem to have a great time and be involved in an engaging exercise that helped their cognitive powers. The question and answer system seemed to work well in engaging the participants, and it seems that this would be a great way to engage any audience. The museum also has a lot of other access programs, that I hope to explore more in the future.